This page is dedicated to getting you orientated. 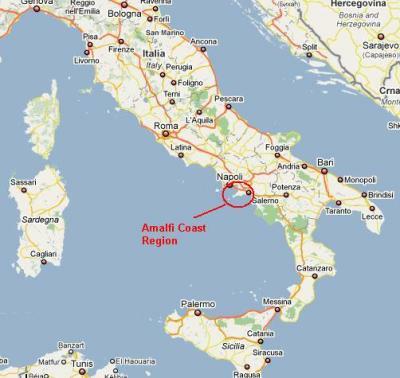 Use the Amalfi coast map to figure out where where is Amalfi and where you might want to base yourself. Use this page in conjunction with our Amalfi travel page to decide how you will get to this region and once there how to best get around. The Italy map above shows the location of the Amalfi Coast in relation to the rest of Italy. 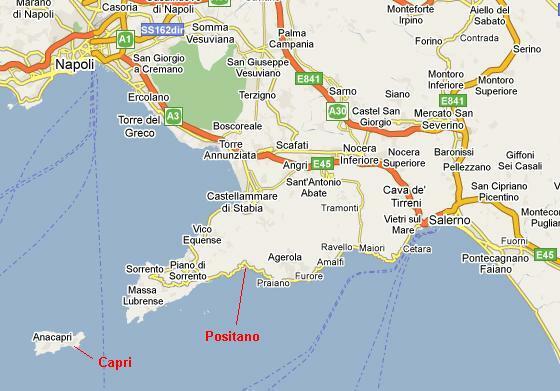 Main ports close by are, Naples (Napoli) to the north and Salerno to the South. Sorrento is the largest, closest town in the actual Amalfi Coast region. Naples is a big city and is to be avoided for many reasons. Unfortunately, most of us will need to commute through this city as it is a hub. Do so quickly and be on guard. See more on this on our Amalfi Travel page. Map showing Amalfi Coast and surrounding areas. Use the controls to zoom in/out and move around. Note the one way system. You do not want to drive into Positano, apart from it being a restricted traffic zone. Walking is the way to go. Most hotels are either in walking distance of the main town and/or offer free shuttle services. Hybrid map of Malfi and Ravello. You can see from this map of Amalfi and Ravello that Amalfi is very much down on the water and Ravello very high. The views from Ravello are magnificent. Be warned if you think the drive from Ravello to Positano looks easy, think again. This trip took us over an hour in a van taxi, we weren't paying thank god, and several of the crew weren't feeling the best by the end of it. Looking for something and can't find it on our site? Drop us a note and we will try and find it for you and add it to our site for future visitors.